Cloud DVR from linear TV: With Edgeware TV Content Capture technology, you can record the live TV content in the network instead of on a physical device in every home. You can let users access the recorded shows just like any other on-demand content. Multiple users can access recordings of the same program, but it only needs to be recorded once, resulting in a huge reduction in storage space. 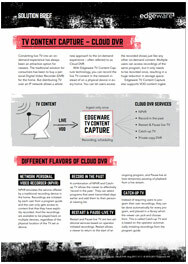 Edgeware TV Content Capture also supports VOD content ingest.